Make coming home a pleasure by making sure your entryway – also known as a foyer or vestibule – is the perfect transition from the public world to the private world. Your choice of front door, the organisation and general flow of the entryway should be practical and reflect the style of your home. Your entryway, foyer or vestibule is the first impression guests will have of your home. Does it reflect you and your household? 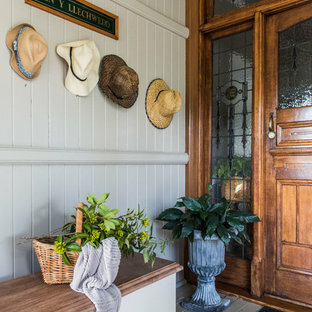 Here are a few ways to make your entryway better - and if all else fails, there's always hiring an interior designer to help. 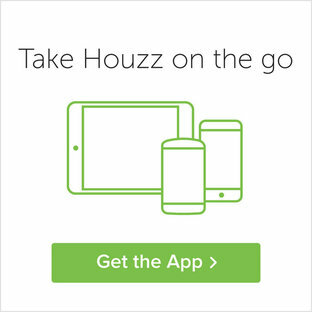 How can you make your front door stand out? Front doors can make or break a home’s appeal. An outdated or ill-fitting front door will imply what lies beyond is just as overdue for a makeover. No one wants a front door that stands out for all the wrong reasons, so choose one that suits the style of your home. Aluminium doors, for example, are more suited to contemporary-style homes, whereas ornate timber doors suit period homes. That doesn’t mean you can’t inject some of your own personality, though. While the architectural style should remain the same, you can shake things up with paint colours and quirky door handles. If you’re planning a new home, play around with the size and shape of your entrance door, too, and if you want to include a screen door, look for one that architecturally complements the existing front door. How can you create an organised entryway or foyer? An organised foyer requires smart storage solutions – otherwise it’s at risk of becoming a dumping zone. Think about what you do when you first walk into your home. Most people will put their keys down, store a bag or coat, then take their shoes off. If this sounds like you, and your entryway is relatively sizeable, consider including some built-in joinery or a slimline console or hall table. Otherwise, hooks for keys, a coat stand and shoe rack will suffice. If you have a large family, allocate one drawer or shelf to each member of the clan. And finally, don’t overcrowd this area with belongings that can’t be stored in a bedroom. When guests arrive, you want to be able to offer them somewhere to put down their belongings. Could a dirt room save your floors and entry? Having a mudroom isn’t commonplace in Australia and New Zealand, but it is becoming increasingly popular as a means to keep mess at bay. In coastal areas, it is sometimes referred to as a sand room, while in rural areas, it can be known as a dirt room. A mudroom is usually a secondary entrance or located at the back entrance, and is ideal for storing shoes, school backpacks, sports equipment and pet essentials. You don’t have to dedicate an entire room to a mudroom. A narrow hall or partial wall will do the trick just fine – just add built-ins, some cubbies for individual family members and a bench. If you have a laundry that has direct access to the outdoors, it’s an ideal opportunity to convert it into a multi-purpose space. Combining a laundry and mudroom is a logical and effective use of space. If there’s no room inside, take a look outside. If you have a verandah, cordon off an area for the likes of dirty soccer boots and surfboards. 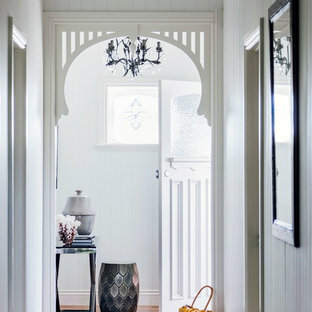 Photo of a beach style entryway in Melbourne with grey walls and dark hardwood floors. Design ideas for a contemporary front door in Sydney with light hardwood floors, a pivot front door, a metal front door, brown walls and brown floor. Design ideas for a modern front door in Gold Coast - Tweed with grey walls, concrete floors and grey floor. Large country front door in Brisbane with grey walls, painted wood floors, a single front door and a medium wood front door. 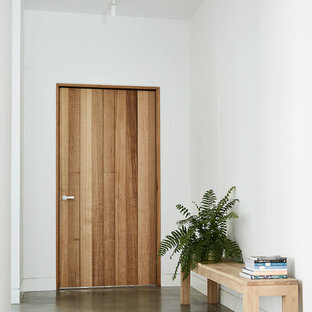 Modern entry hall in Melbourne with concrete floors, a single front door, a medium wood front door, white walls and grey floor. Design ideas for a contemporary entryway in Brisbane. 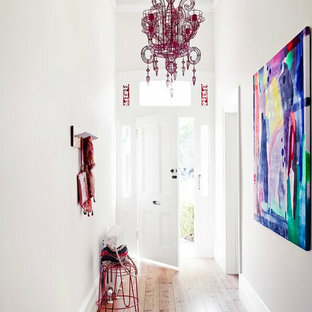 Inspiration for a transitional entry hall in Melbourne with grey walls, dark hardwood floors and brown floor. 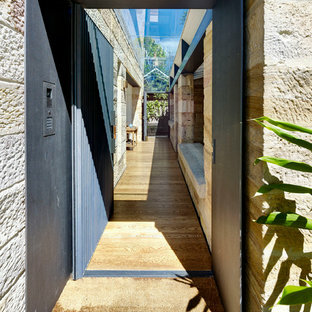 Photo of a modern front door in Sydney with white walls, a pivot front door, a white front door and white floor. Traditional entry hall in Melbourne with blue walls, light hardwood floors, a single front door and a blue front door. Inspiration for a contemporary foyer in Adelaide with white walls, a single front door, a medium wood front door and grey floor. 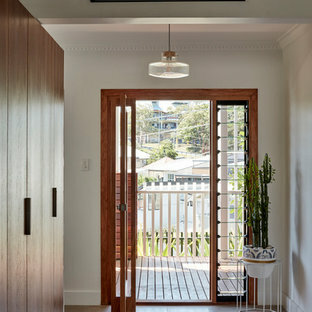 Traditional front door in Brisbane with white walls, medium hardwood floors, a single front door and a white front door. Inspiration for a beach style front door in Sunshine Coast with a single front door and a glass front door. This is an example of a contemporary front door in Canberra - Queanbeyan with a single front door, a black front door and grey floor. This is an example of a transitional front door in Sydney with a double front door, a black front door and beige floor. 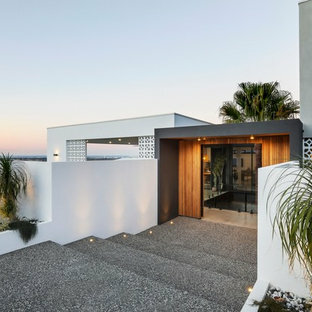 Photo of a contemporary entry hall in Perth with white walls, dark hardwood floors, a single front door and a glass front door. This three level family home has a double height living area that features the mews entry doors. Other heritage features are juxtaposed with contemporary materials to suit modern day living. The timber cantilevered stairs are a feature of the house, allowing views through the main space. Efficient planning maximises private and shared spaces. Builder, GNC Quality, foreman, Michael Filitonga. 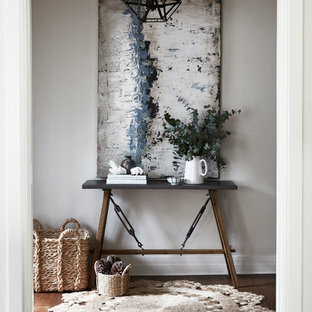 Design ideas for a scandinavian entryway in Melbourne with white walls, a single front door and a light wood front door.